We crammed a lot of fun and excitement into one week...starting with the arrival (read the previous post). Friday night after my shift was over I got cleaned up and we drove down to walk the Marina. We ended at Damn Good Food To Go and I had a deli sandwich while Carrie enjoyed a Boca Burger. Our hunger satiated, we walked up to Duval and surveyed the scene for a few blocks, long enough to buy souvenirs at Hard Rock Cafe and admire the "wildlife" (tropical birds and lizards that you can pay to have your picture taken with) on our way back to the car. Saturday I had to work from 8am to 4pm, so Scott took Carrie to the Waterfront Market for sandwiches. After I was done at the pet store, Carrie and I went to Salsa Loca for dinner and then to the Blonde Giraffe for Key Lime Pie (dipped in chocolate and on a stick). Sunday morning we all slept in a little and then Carrie and I went to IHOP for breakfast. We took a short drive around the island and then found a parking spot a few streets over from the Green Parrot, where Scott's band was scheduled to play at 3pm. Right as I was parallel parking the BMW, a torrential downpour started and we had no choice but to brave it. Carrie found shelter under an overhang while I plugged the meter, and then we ran the two blocks to arrive just in time for the first song. Butcher Hollow featuring Tyvek Velvette rocked the house, and a great time was had by all. Carrie and I walked Duval and shopped a little while Scott and the band packed up, and then we met up at Kelly's for some beverages. Our stay at Kelly's wasn't too long, as we decided to make homemade pizza for dinner. Monday I worked a split shift - 8am to 11am and then 4pm to 8pm. Carrie and I managed to squeeze in a little pool time in between and then after the later shift the three of us went to Virgilio's for dinner and drinks, both of which were fantastic. Tuesday we hit the pool again for a little while and then enjoyed lunch at Goldman's Bagels before I went to work. We enjoyed a quick meal of appetizers at Outback with Scott and Justin and then retired back to the house. Wednesday morning we spent more time poolside before I had to go to work at 2pm, and then headed out to the Sunset Lounge to sing Karaoke. Thursday I had the day off, so we set out for a drive up the Keys at about 10:30am. We stopped for coffee at Baby's Coffee before setting up on the beach at Bahia Honda. Turquoise water the temperature of bathwater, overlooked by blue skies. We waded for about an hour and a half to build up an appetite and then shared a Gardenburger at Rob's Island Grill on Big Pine. On the drive back to Key West we stopped at Boondocks to play a round of mini-golf. Fortunately there are misting poles throughout the course, or we would have broiled to death. 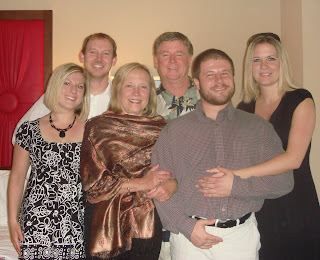 Once back in Key West, we napped and then went to El Siboney for a fabulous dinner of Cuban rice, beans and plantains, followed by a piece of Key Lime Pie from Kermit's. This morning we slept in and then joined Scott for lunch at The Cafe. I dropped Carrie off at the airport just before 4pm where she managed to get on a 4:55pm flight to Miami since her 4:17pm flight to Tampa had been delayed to around 5:30pm. Carrie is here for a week as a college graduation present from Scott and myself. Friday as I was clocking in at work my cell rang and it was Carrie. "What?! Why? Why aren't you in California? I'm confused!" Scott and I booked Carrie's flight online. She told me she had the 21st through the 27th off and we managed to snag a 12:30am flight on Friday the 21st for her. Thursday night around 9pm Dixie asked Carrie what her plans were for Friday and what time her flight left. After checking her itinerary Carrie discovered that the flight left in 3 hours and she had not packed yet. I'm not a dummy. Scott is not a dummy, and Carrie is certainly not a dummy. But we all assumed that 12:30am on Friday meant "Friday night just past midnight" as opposed to "Thursday night just past midnight." Fortunately she had already run a load of laundry and it was in the dryer, so packing hastily wasn't as chaotic as it could have been. Dixie sped Carrie to the airport and she barely made the flight. 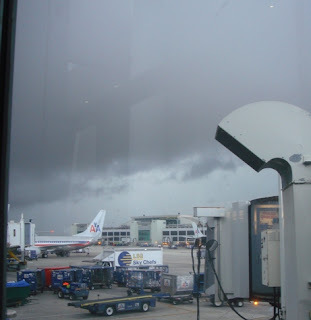 The connecting flight in Houston went as planned but on approaching Florida, the cabin was notified by the crew that they were diverting to Orlando instead of landing in Tampa due to bad weather. Once on the ground in Orlando, the flight de-planed and then re-planed and went to Tampa. 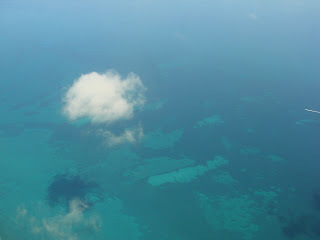 Since her original connection to Key West had already left, the airline managed to find a flight from Tampa to Miami to Key West. My cell rang again at about 4:20pm and I assured Carrie I would come pick her up right away. I managed to find someone to cover for me at work for about 15 minutes and I hurried to the airport. After the hugging we threw the luggage in the trunk and drove back to work where Carrie was entertained by the Dutch Shepherd puppy and I finished my shift. "Here I Am... at Six O' Clock in the Morning..."
Scratching the back of my throat with the back of my tongue. Ick. It doesn't hurt, or burn, it just itches uncontrollably. I came downstairs in search of some lozenges and haven't found any yet, so I am drinking ice water with a hefty squirt of lemon juice in it. It helps a little. Now is NOT the time to be sick! I'm two days away from the end of a six-on-one-off-six-on schedule and Carrie is coming to visit for a week on Saturday. NO SICK. NO. I won't subject you to a photo of the back of my throat. Unless it gets really interesting. Anyone that has known me well for any length of time knows that my favorite TV show of all time is Whose Line Is It Anyway?. At one point I had 5 VHS tapes full of American and British versions of the show. I can watch reruns of it many times over and still laugh hysterically, even when I know the punch line that is coming. Some of my favorite games on the show are "Props", "Scenes From a Hat", "Greatest Hits", "Hats", "Whose Line" and "Song Styles". My favorite performers and of course Colin Mochrie and Ryan Stiles, Wayne Brady and Greg Proops. Wayne Brady is a very talented performer, comically talented, but very musically gifted as well. He was responsible for a "Song Styles" game dedicated to a Lunch Lady named Lee. Wayne has to perform the song in the style of a "Strip-O-Gram" and makes up the entire song on the spot. I don't think I have every laughed so hard at anything on TV in my life. Can you fix me a treat? When you're servin' all that food. Do you like it, Lee? Two years running I was fortunate enough to see "A Night of Improv" live in Portland. The cast of this tour consisted of the majority of cast members and guests from WLIIA, and the first year had Drew himself as a special guest. Greg Proops opened the show with about 15 minutes of stand-up directed particularly at the Northwest audience, to great response. Ever since, I have searched for this tour, but haven't seen the full group performing anywhere together. If you have the opportunity to see improvisational comedy by any of the cast of WLIIA, do not miss out. You will laugh until you pee. It's 12:24 in the morning and I just sat down on the couch to relax. In the last 3 hours I made lasagna, salsa and smoothies. The salsa was by request of my boss, Jennifer - after she tasted the last batch. I don't generally measure stuff unless I'm using someone else's recipe for something. Following are approximate quantities for the evening's creations. Mix above ingredients in the bottom of a large bowl. Blend in food processor and add to bowl, mix. Add to the bowl, mix. Blend in food processor and add to bowl, mix. Add about 2 tablespoons of lemon juice and about 3 teaspoons salt. Cover and refrigerate overnight and then add salt or lemon juice as needed. Mix in bowl and set aside. Brown in pan on med/high and set aside. Boil about 15 lasagna noodles, drain and rinse under cold water. Spread about 3/4 cup of your choice of Sauce in the bottom of the pan, place one layer of noodles over sauce. Spread a level of ricotta mixture, then noodles, then burger mixture, then noodles, then sauce, then ricotta, etc. until pan is full. Top with sauce, cover with tin foil and bake at 350 for 20 minutes. Remove tin foil, top with shredded mozzarella and return to oven for about a half hour or until cheese browns and bubbles. It's now 12:45am and I'm going to try the lasagna. So far, that's the most I've had at one time but some people think it's too many. 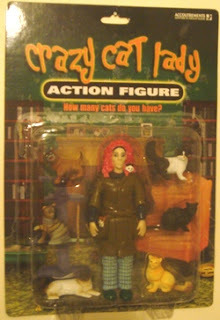 One of these people is my friend Sue, who very kindly sent me the action figure seen at right. Do you get excited when you hear a can opener? Do you think cats are smarter than people? Do you feel Tom is more talented than Jerry? Do you have more cats than ex-boyfriends? Do you bring new boyfriends home so the cats can meet them? Do you later break up with them because the cats weren't impressed? Do you spend more on doctor bills for your cats than for yourself? Do you buy the ice cream your cats prefer instead of the kind you like? Can you tell your cats apart by the roughness of their tongues? Have you ever warned a guest not to sit on a specific piece of furniture because it belongs to the cats? Do you own more than once piece of clothing with a cat on it? Do you have a website devoted to your cats? Do you have a website for each cat? Do you spend more on Christmas presents for your cat than for your family? Do you buy more than one kind of cat food because a few of your cats are picky eaters? Have you ever had to explain to a police officer that the stuff in the bag really is catnip? Do you feel that the ancient Egyptian tradition of cat worship is the one true religion? 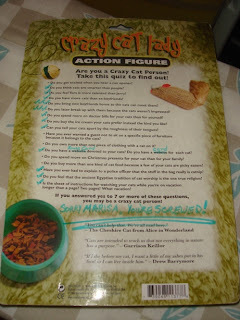 Is the sheet of instructions for watching your cats while you're on vacation longer than a page? Two pages? What vacation? If you answered yes to 7 or more of these questions, you may be a crazy cat person. Sue very kindly checked off the questions she felt applied to me. At the bottom she kindly inscribed "Sorry Marisa, you're screwed!" No, because I only have a manual can opener and it doesn't make any noise. Sometimes, depending on the cat and the people. Minx is smarter than a lot of people. No, Tom was a dummy. No. I only have 3 cats and I have about 4 or 5 times that many ex-boyfriends. Yes. Ok, not really, but if my cats don't like someone I usually don't end up liking them in the long run, either. Yes. At one time I spent about $450 on a cat to have his teeth cleaned. Twerp had some nasty teeth and required anesthesia to have them taken care of. No, but they aren't too picky about the kind of ice cream they like, either. Chou will eat anything. Chips, ice cream, corn, peas, and beer. Maui eats anything humans will eat and loves dog food. Minx eats plastic bags. No, but I can tell which one of them has jumped on the bed in the dark by the weight of their step. Yes. I don't think the cat tree would hold very many people, anyway. Yes. I have several pairs of socks with cats on them. No. I spend way too much on my significant others and about half as much on my cats. No. I only buy one kind of cat food because they all eat out of each other's dishes. No, but it would be fun. YES. Minx is the queen. Yes, No, and we go on vacation! Still, I have had 3 cats at a time consistently for the last 7 years. Before that I had at least one cat as far back as third grade, and I know that we had cats when I was a very young child, as well. I admit that I talk about my cats a lot. In my defense, they are pretty great cats. People that don't like cats fall in love instantly with Chou. 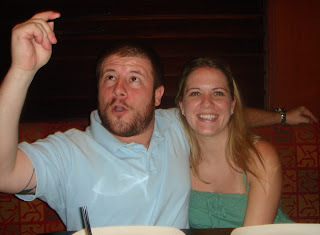 Playful and childlike, you are everyone's favorite friend - even if your goofy antics get annoying at times. You are famous for: Always making people smile. From your silly songs to your wild pranks, you keep things fun. How you life your life: With ease. Life is only difficult when your friends won't play with you! I'll bet you think I'm going to explain that title away with some clever pun or story. I'm not. I'm a nose-picker "for real." I didn't ever pick my nose until high-school. I'm not sure when it started or why. Well, I guess the why is because I became very sensitive to having anything poky IN my nostrils. I can't stand the feeling of something in there, it seems alien. I'm not a pick-my-nose-in-front-of-a-crowd sort of picker, and also not a shirt-wiper (unless I'm en route to throw the shirt in the wash). I have known which of my relationships were "good" ones by the fact that my significant other was ok with the knowledge of my pickitude. Sorry Mom, I'm sure you're horrified, but you can rest in the fact that it wasn't bad parenting that caused me to have such a disgusting habit. I'm also pretty sure I didn't get it from my Dad, while I do fuzzily recall him "cleaning" with a pinkie once or twice, I wasn't living at home when I took it up. Sign me up for NPA, "I'm Reese, and I'm a Picker." Our journey home started with our cab ride from the Paris to McCarren airport. Once in the cab we realized that our driver had no intention of taking us the fastest route, and didn't even ask which way we wanted to go. He was also talking on his cell phone the entire time. No tip for ACE cab #6663. We tried to check in using the self-service kiosk, but the computer could not find my itinerary. We persuaded a clerk to help us and managed to off-load our checked baggage at the security drop-off without further hassle. 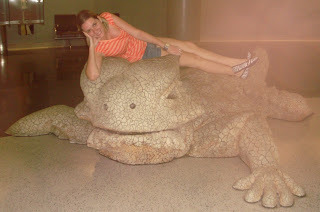 We had a little time for hi-jinks with the lizard statue on the way to our gate. Our flight boarded on time and we each took a Dramamine before take-off. We both managed to sleep most of the 4+ hour flight to Miami and stumbled off the plane at about 6:30am EST. Our connecting flight to Key West was scheduled to depart at 10:10am, so we again found a corner in the airport and fell asleep, setting an alarm to wake us in time to board the plane. Right on time we boarded the bus to take us out to our small plane. Instead of stopping at the plane, the driver continued in a circle and dropped us back off at the starting gate. Our bewildered bunch of comrades piled OFF the bus and back in to the terminal. Soon the helpful intercom voice announced that our flight was canceled due to "maintenance issues" and to "please see the help desk located across from the escalator." The next flight to Key West was at 1:10pm and was already full. We managed to secure seats on the 2:15pm flight and were given a $20 voucher to use upstairs in the remaining 3+ hours we had to wait. Back to the nap zone. About 20 minutes before we needed to be back downstairs at our gate, Scott spent the voucher at a Starbucks, loading up on teas and juices since it was a "use it or lose it" $20. We also got a call from Katie and Kevin, who were still in Vegas after having their flight to Seattle canceled, being bullied and nearly kidnapped by a psycho cab driver, booking and canceling a room at one hotel, finding a room at another hotel, and scoring free tickets to come visit us for their trouble. It seems that all the luck of 7-7-07 caused a distinct curse day on 7-8-07. Saturday morning we woke slowly and groggily, having been out on the town until rather late. We packed up and checked out of our rooms, leaving our bags with the baggage service outside the front of the hotel. Carla set up a post at the pool and held all our miscellaneous stuff while the rest of us returned to the Miracle Mile to shop for about an hour. Gary also purchased Scott some clothes at Ben Sherman as a birthday present, while I hit a shoe store and a sale at the Gap. 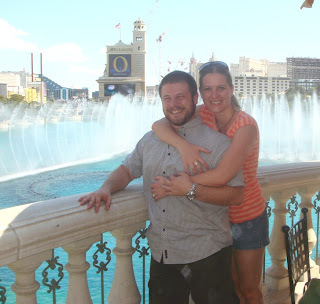 We returned to the pool to collect Carla and then walked to the Bellagio to have lunch at Todd English's Olives. Our table was on the veranda overlooking the fountain, shaded by an umbrella with built-in misters. I ordered the Butternut Squash Tortelli, which turned out to be the favorite dish at our table. Just after our food arrived, the mister right above me started spitting great drips of water into my hair, my food, and my wine-glass. A quick-thinking busser wrapped a cloth napkin around the pole, covering the errant spout. We relaxed and enjoyed our lunch and several fountain shows, topped off with a bit of an impromptu family haiku battle. Scott enjoyed a Chocolate Fallen Cake as a Birthday treat and then we were off to Bally's. By this time I was exhausted and I curled up on a bench in the lobby and took a short nap. We took refuge in Le Burger Brasserie and quenched our dehydrated throats, followed by seeing Gary and Carla off as they left for the airport. Katie, Kevin and Scott took seats at tables in the Poker room and I made the most of the Tabasco and Wheel of Fortune slot machines nearby. Eventually it was time for Scott and I to head to the airport, so we said our goodbyes to Katie and Kevin and caught a cab. "Your Mother Was A Hamster..."
Friday morning started out with an appointment at the Salon in the Paris. I got a haircut and then met up with Erin in the lobby. We enjoyed some tasty crepes at La Creperie and then sat by the pool for an hour or so. Once cooked sufficiently, we went back upstairs and napped until Scott returned from the poker tables. Erin gave us a ride to Caesars Palace so we could stroll along the Forum Shops. Surprisingly, I didn't find anything I wanted to purchase that was anywhere NEAR my price range, so we walked back to the Paris - much relieved to arrive back in the air conditioning. Scott and I found sandwiches for a late lunch at the Boulangerie, then rested upstairs until it was time to get ready for the evening. Dressed in our best, we met in Gary and Carla's room before acquiring two cabs to take us to the Wynn for our evening event. We arrived with about 10 minutes to showtime, which was just enough for a bathroom break and quick stop at the souvenir table where I purchased an official program and Killer Bunny hand puppet. John O'Hurley stars as King Arthur in SPAMALOT - "a musical lovingly ripped off from the classic film comedy Monty Python and the Holy Grail", joined by The Lady of the Lake and the Knights of the Round Table. Whether you have seen the film that inspires the musical or not, SPAMALOT is chock-full of laughs, insults and elderberries. Scott is a HUGE Monty Python fan, and the rest of us are MP appreciators at the very least, so the show brought us much enjoyment. Just outside the Grail Theater is the restaurant Corsa. I ordered side dishes as an entree as I wasn't very hungry, and enjoyed the potatoes very much. The Broccolini was nasty. 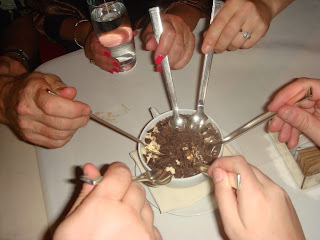 We finished off dinner sharing a Tiramisu before taking a short tour of part of the beautiful Wynn casino. We slept in until about 9am on Thursday, and would probably have slept longer if it wasn't for being woken by Scott's mom letting us know she was on her way to the pool. We managed to throw ourselves together and stumbled down to find deck chairs. In the water we were able to withstand the blistering heat, but only for about an hour and a half. Gary came down and took us to lunch at the poolside cafe around 11:30am. After lunch we cleaned ourselves up and braved the strip long enough to cross the street and head into the Miracle Mile shops attached to Planet Hollywood (previously the Aladdin). The ladies enjoyed the wonders of Sephora and then Scott whooped for joy when he saw the Ben Sherman store. I bought him two pairs of shorts and some shirts as an early birthday present, we then re-joined with Carla, Kevin and Katie and had a "snack" at P.F. Changs. We napped for a bit and then headed downstairs to Napoleon's Dueling Piano bar. The ladies had drinks while the men had cigars and then we proceeded to a late night dinner at the Boulangerie/Patisserie nearby. "It's Like a Heat Wave, Burning in My Heart"
My second (ever) trip to Las Vegas began on the morning of July 4th. We managed to pack and finish cleaning our house within about 2 hours, then threw our luggage into a taxi and headed to the airport. Our plane from Key West to Miami was on time, and while we waited, Scott took a Dramamine and I took a Benadryl. I managed to stay awake long enough to snap some great shots of the water and then crashed for the remainder of the half-hour flight. Touching down in Miami we were met by a bus to take us to the gate. After off-loading into the terminal, we prepared for the 3 hour layover by eating a personal Pizza Hut pizza and finding a spot to nap. As the boarding time grew closer, we collected ourselves only to be notified by the P.A. system that due to the thunderstorms in the area, the American Airlines ramp was closed. Our original departure time was 3:30pm and we watched the announcement board change to 4:00pm with disgust and then hope, as we boarded the aircraft at about 4:30pm. Sadly, once on board we sat at the gate for about another hour, waiting for the ground crew to finish loading our luggage. Apparently the union has a rule that if there is any lightning, the ground crew is not allowed outside. Why they think lightning would strike a person as opposed to any number of the other much LARGER objects nearby is beyond me. Touchdown at McCarren airport was about two and a half hours later than anticipated, but we managed to get our bags and a taxi to the hotel by 8:30pm, despite the 114 degree heat. Scott's parents, sister, and brother-in-law met us at the front door of The Paris, swapped us our bags for beverages, and we made our way to our room. We took about an hour to decompress and then took off walking for The Venetian. If you've never been to Vegas, you don't realize how big it is. Not just that the buildings are big, or that everyone is "over-the-top", but that The Strip is several miles long. Just because you can see another casino/hotel from your own quite clearly, does not mean it is a ten minute walk. 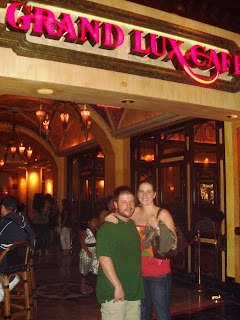 We dodged slow tourists and finally arrived at our goal, only having to wait about 15 minutes for a table at the Grand Lux Cafe. Dinner and drinks down the hatch, we walked at a much more leisurely pace back to our hotel, where I went to bed and everyone else went back downstairs with the intention to gamble, although Kevin was the only one that really managed to stay up. It was to his fortune though, as he won about $775 playing poker. We have returned from our vacation in Las Vegas. I will regale you with tales of our escapades after a nap.